As are some of the preceding headings, that of the present chapter is a makeshift one, as not all taxa discussed in the following are arboreal, and others, which are, belong to groups not considered here. The taxa included here are probably further paraphyletic with respect to the Cariamae, "Falconiformes," and Strigiformes (Chap. 3; Ericson et al. 2006; Hackett et al. 2008). 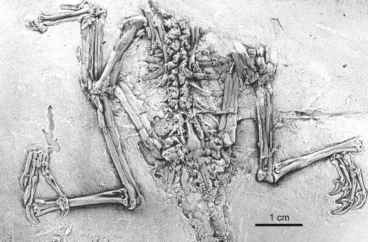 There exist osteological similarities between stem group representatives of the Coliiformes, Psittaciformes, and Passeriformes (Zygodactylidae), on the one hand, and between those of the Trogoniformes, nonleptosomid "Coraciiformes," and Piciformes, on the other. The Leptosomidae stand morphologically apart from the other taxa. The fossil record of these birds dramatically increased in the last few years and includes numerous well-represented taxa. Still, however, the evolutionary significance of many of these is not fully understood.